Next post: A book double-header! 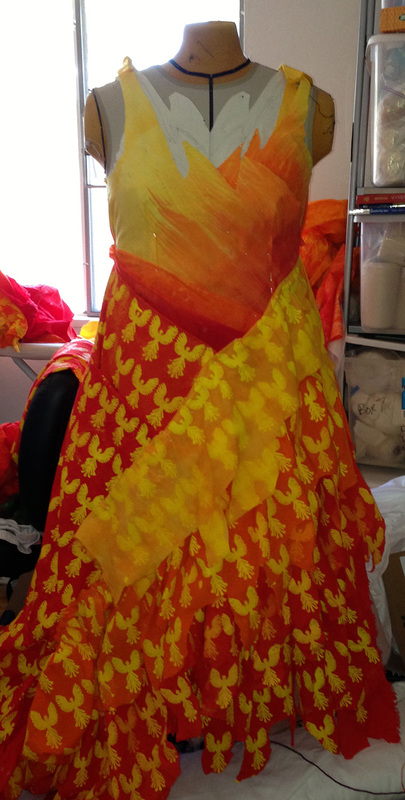 I spent a few days fabricating more dyed/printed muslin, and refining the bodice/skirt design. I decided to keep the overall outline from the first version of the bodice, but not the three sections. I made the skirt, cut flame-shaped edges from the tiers of the skirt, and ruffled each tier to make them stand out from each other. And I started work on the back. I am also considering adding drapes. In particular, a drape thrown over the right shoulder with a solid yellow background, with phoenixes shading from gold to orange to red, would be lovely. But it would also be beautiful to add a red drape on the lower back, completing the “phoenix” visual in the bodice. (The two halves of the bodice look like “wings of fire” to me, and adding the tail would be a nice touch, I think.) I don’t think I can have both gracefully, so I’ll have to model both and pick one. I’m definitely not happy with the back side of the skirt, and will likely redesign it completely. Also a task for the next few days. And Monday I leave for ANWG, the Pacific Northwest’s weaving conference! Looking forward to meeting lots of weaving friends, old and new.